The original process invented by Alois Senefelder in 1796 was based on the use of Kelheim stone. The slab was ground and polished and an image drawn onto the surface with greasy ink or crayon. The stone surface gave good anchorage to the image. The non-image areas of the surface were then treated with a mild acid and coated with gum arabic to make them water-receptive. To obtain a print, the stone was first damped with water, then inked with a greasy ink. The greasy image repelled the water, leaving the image dry so that when the ink roller passed over the surface ink was transferred to the dry parts of the surface but not to the moist non-image areas. This principle of differential inking of the surface has remained the principle feature of lithography, which although it has developed considerably since Senefelder's day continues to use its orginal name, lithography, stone writing. The principle of lithography exploits the phenomenon that grease repels water. An ink-attracting, water repelling image is formed on the modern aluminium plate by photgraphic means. The non-image areas of the plate are rendered w ater- attracting by coating the plate. When processed, the plate is fitted to the cylinder of the offset press where it is first damped by cloth rollers and then inked by rubber rollers. 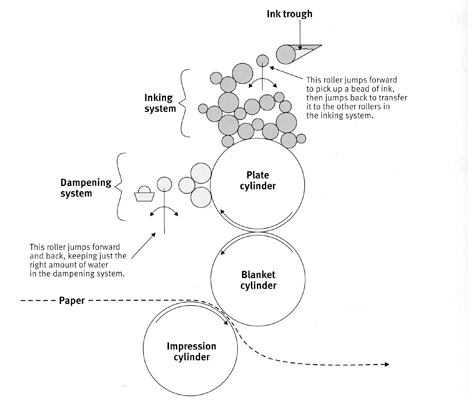 The inked plate image is then transferred by contact pressure to a rubber covered cylinder (blanket cylinder) which in turn impresses the image onto paper which is pressed into close contact with the blanket by an impression cylinder. The image is thus offset from the plate to the paper. The use of this soft rubber covering on the offset cylinder allows a variety of coarse surfaced papers to be printed by lithography with success. Most of the aluminium plates used today carry a tough coating of aluminium oxide (anodised) on the surface which gives the plate good water carrying properties together with corrosion resistance. The photographic plate image is formed by exposure of a photosensitive diazo or photopolymer resin which has oleophilic qualities and is capable of producing 200 000 press copies or more. The non-image areas of the plate are treated with Gum Arabic to make them water-receptive. On the press, moisture is applied to the plate to allow for differential inking of the image. Water may be quite suitable for plate damping but it is more common for the water to be doctored with a mild acid to bring its pH to about 5.6 and substances such as Gum Arabic or alcohol are added to reduce the surface tension of the water. Fountain solution additives of this nature are supplied commercially and are recommended by plate manufacturers for the efficient working of their plates. In addition to the use of chemicals in the fountain solution the pressman will often use an acid based solution called 'plate etch' for cleaning the non-image parts of the plate. Plate etch is necessary for removing ink which has become attached to the non-image areas of the plate. Its action is designed to make the plate surface clean and to give the desensitising properties of the Gum Arabic its full effect. The surface of the litho plate is roughened to produce a uniform grain. This is done before the plate is coated with a photosenstive resin. Traditionally the grain was applied by abrasive powder and marbles shaken over the plate in the presence of water. This process has been superseded mainly by electrolytic graining, brush and sand blasting methods. The purpose of the grain is to produce minute hills and valleys on the plate surface which give anchorage to the image forming resin. The plate image must adhere tenaciously to the plate surface where it is subject to powerful tack forces during the printing cycle. The grain also increases the surface area and thus increases its watercarrying properties, together with offering good traction properties to the damping and inking rollers which pass over its surface. Another feature of plate grain is its effect on the surface tension of water. Like many liquids, water has a surface tension in which the molecules draw the water into globules. If water is spread over the polished back of the litho plate it will reticulate into globules and not wet the surface uniformly. The grain on the plate however reduces this tendency and uniform damping of the surface is achieved without flooding the plate. A coarse-grained plate will carry more water than a fine-grained plate but the reproduction of half tone images will be adversely affected by the profile of the grained surface and therefore a compromise has to be reached between these two factors.